The concept of leadership has always intrigued me because it is not only a huge responsibility, but one we often find Muslims complaining about in the modern world – we argue that we don’t have leaders in the Muslim community, we feel frustrated that there is no one taking a lead whilst conflicts prevail in the Arab world, and we are always looking to nurture leaders of our Islamic organisations without actually realising that the very best examples are within Islam itself. 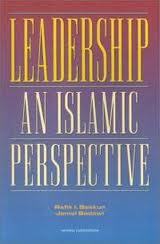 In light of this curiosity I found ’Leadership, An Islamic Perspective’ lying at the bottom of a bookshelf in the local store. What is quite beautiful about this book is that it combines the mainstream notion of what it takes to be a leader and enriches it with examples from our historical and contemporary times about what it means to be not only a leader, but also a follower – for every leader must also be a follower at some stage. Beekun and Badawi unveil the star qualities which made our leaders in Islamic civilisation as outstanding as they were and suggest that one of the definitions of leadership from an Islamic perspective is that it is: ”the process by which the leader seeks the voluntary participation of followers in an effort to reach organisational objectives” or in other words: ”leadership is essentially a social exchange process. There can be no leader without followers, and no followers without a leader. The leader as the organisation’s visionary, must communicate the vision with clarity and conviction”. Writing on this crucial topic, the authors draw our attention to the traits and qualities of a leader making reference to ahadith and verses from the Quran; their use of ’The Locus of Leadership’ shows us that there is actually 3 areas in which a leader’s skills must be developed: through their leadership characteristics (how they develop their followers), follower characteristics (how they work in exchange with others), and finally situational characteristics (how they apply certain traits suitable to the situation). Whilst reading you’ll gain insight to your own leadership skills and the questions probe you to think about your own qualities as an leader to help you be more productive in the workplace or beyond. But I’m not cut out to be a ‘Leader’? You may very well ask that question in your head – this is where being a follower of a leader who is a role model, coach and mentor is significantly important. The Prophet (peace and blessings be upon him) developed his companions (may Allah be pleased with them all) into the worlds greatest leaders. In summary, Leadership, An Islamic Perspective is a beautifully written guide for those who are already leaders and want to improve themselves, or for those who don’t see that Islam has nurtured the best of leaders. In this Ummah we truly have the potential to be productive and leaders of our community either at home, work or the wider world. It is packed with practical steps to help individuals and Islamic organisations develop and nurture leadership skills, comprised of engaging case studies based on scenarios in the workplace, filled with exercises and enriching examples from Islamic civilisation – all this combined will marvel those who want to be a leader in their community and give them a new set of lenses to perceive what it means to be a leader in Islam.